My husband, Dave, and I baling hay. 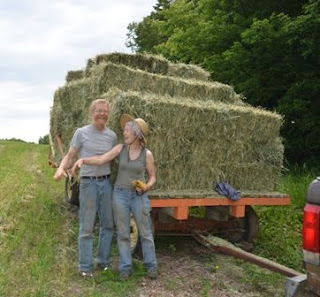 I live on a small farm in west central Minnesota with my husband Dave, cat Oolong, dog Newton, 40 sheep, 6 goats and an alpaca. We started with four sheep one June almost thirty years ago. That fall, we bred those four sheep to a big, ornery ram who lived in a neighboring county. And that's when it all began. To learn more about our adventures, heartbreaks, and triumphs, read my book Shepherdess: Notes from the Field. Our town, Pelican Rapids, is a vibrant community of 2,464 that has undergone some astonishing changes in the last 30 years. In 1982, Pelican Rapids had a population of 1,835, and the local business directory listed eighteen churches in the area, thirteen of which were Lutheran. By 2000, the population has surged to 2,374, and eleven languages were spoken in town: English, Spanish, Vietnamese, Serbo-Croatian, Somali, Laotian, Ukrainian, Russian, Sudanese, Arabic, and Kurdish. Refugees flooded into Pelican from all corners of the world in search of work, safety, and community. To learn more about the amazing changes our community has undergone, and hear the stories of the people who created it, read my books The Faces of Change and Many Cultures, One Community: a Book of Stories and recipes. At Northcroft Wool, we raise wool for hand spinners, felters, knitters, crocheters and weavers. We farm in the most sustainable way we can, limiting our use of herbicides to the absolute minimum. Our wool is washed with dish washing detergent and not treated in any way to bleach it or make it washable (you have to use old fashioned care when washing our wool). Our sheep and their lambs are only given antibiotics when illness or injury demand treatment. Otherwise, they are fed our untreated hay, corn and natural pasture grass. We sell fleeces, carded wool batts, carded roving and yarn in beautiful natural colors and in luscious naturally or commercially dyed options. Check back soon for links to our online store! I have an enduring love of fiber art, in all its forms. I have been accused of spreading myself too thinly, learning technique after technique. I may never be great at spinning, or knitting, or crocheting, or weaving, or felting. But I will make beautiful things. I explore my passion for fibers in my newest book, From Sheep to Shawl: Stories and Patterns for Fiber Lovers, published by Wandering Minstrel Press. Use this book to learn a new fiber technique, or one that you've admired, but never tried. Expand you skills by trying a pattern that is more complex than anything you've done before. Or use the patterns as a jumping off point for your imagination. Play with color, with fiber, with stitch, and with design. Take a walk on the wild side. If you aren't a fiber artist yet, you will be. In the late 70's, I retired from a career in biochemistry to raise my two daughters. I loved being at home with my children, but my desire for a professional life had not diminished. When I thought about rejoining the workforce, I was faced with the choice of driving 2 hours a day to work in the biochemistry field, or taking an assembly line job in our rural community, population 1,865. Neither choice appealed to me. What I needed was a new career - one I could pursue at home. I enjoyed knitting mittens, hat, scarves, and sweaters, turning long, beautifully colored strands of yarn into clothing. I enjoyed the feel of the wool and the feeling of accomplishment when I finished a project, from raw wool to warm mittens. I loved animals. At the time, we had one parakeet, two dogs, three cats, and twenty-five brown, New Hampshire chickens. We lived in the country, where people raised cows and sheep. Sheep were small, I could handle them easily. 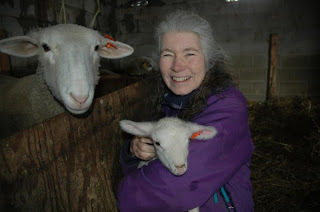 I became a shepherdess, and my projects became really mine from beginning to end, from sheep to sweater. 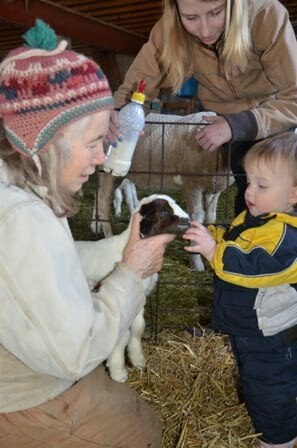 As a shepherdess, I am a member of a small but respected profession. I make my own decisions, and my sheep mind me - a habit my children outgrew rapidly. I earn real money. And when people ask me, "What do you do?" I answer with pride. It generally takes me about three years to knit a sweater. By the time you've spent that long on a project, it is either a good friend or a beloved enemy, so I name most of my sweaters. The longest weaving I ever tried was a back strap piece that stretched from one end of my living room to the other. It was horrible to work on and I soon came to hate the design. I never finished it. The biggest felted project I have ever made was a color wheel felted onto a base of blue rigid house insulation. It is presently in a traveling exhibit called From Sheep to Shawl. It is 42 inches in diameter. I love dyeing wool. The colors are so entrancing. My favorite natural dye is the beautiful green produced by Common Mullein with a copper sulfate mordant. I love identifying flowers and other plants.